(L-R) Recording artists Drake, Ariana Grande, and Justin Timberlake. 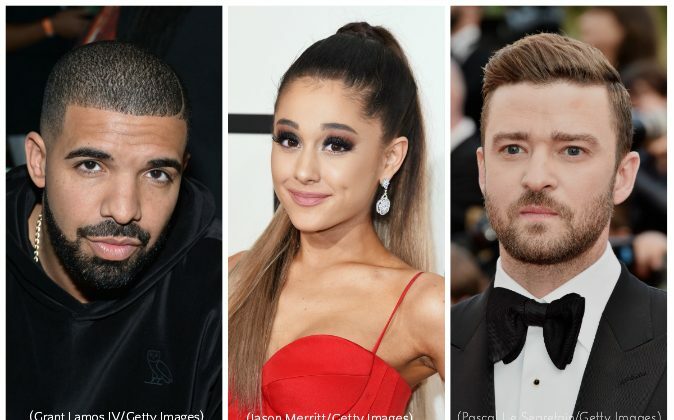 Spotify released its musical contenders for this year’s summer anthem on June 2 and it includes pop royalty in Ariana Grande, Justin Timberlake, and Drake. The music streaming platform used the analysis from experts, streaming data, and social media buzz to come up with its choices. Ariana Grande’s “Into You” made the list as possible inescapable song of the summer. The Ilya Salmanzadeh and Max Martin-produced track features a sexier side of the 23-year-old, where she sings in a sensual breathy voice about falling deeply in love with her partner. The radio-friendly track starts off as a love song that gradually develops into a pulsating electro-beat-studded dance party. Justin Timberlake’s “Can’t Stop the Feeling” is the latest single from the Memphis crooner for the animated movie, “Trolls.” Timberlake released two videos for the record on May 5 and May 16. The first music video drew cameos from his movie co-stars, Gwen Stefani, Anna Kendrick, Kunal Nayyar, and Ron Funches. They all partook in a listening session of the song, and in various locations sang and danced to the track. Timberlake is the executive music producer for the soundtrack. The second released video—premiered on “The Ellen DeGeneres Show”—begins with Justin Timberlake enjoying a slice of blueberry pie at Cindy’s Coffee Shop and then transitions into him singing as everyday people dance around the Los Angeles area. The “Sexyback” singer even breaks out some of his own dance moves after a three-year gap since the last album. Drake’s “One Dance” is also considered in the running for 2016 summer anthem. The Nineteen85 produced single is the second release off the Canadian rapper’s third album, “Views.” The track features guest vocals from Nigerian Afrobeat artist Wizkid and British singer Kyla. Other artists that are expected to make a dent in the charts this summer include girl group Fifth Harmony’s “Work From Home,” Brooklyn rapper, Desiigner’s “Panda,” country artist Keith Urban’s “Wasted Time,” and Calvin Harris.